ELBROC Mining Products (Pty) Ltd is a recognized leading manufacturer and supplier of In-Stope Roof Support Products to the Mining Industry. This Gauteng based ISO 9001 facility provides patented propriety products with capabilities covering design, development, machining, fabrication, assembly and testing. Mechanical and Hydraulic Props that are used as Sacrificial or Temporary Support along with related accessories forms the core of the business. A Remote Drill Rig, Pre-Stressed Elongate and Grout Pump complete the product range. Equipment is serviced and a full range of replacement parts is available. 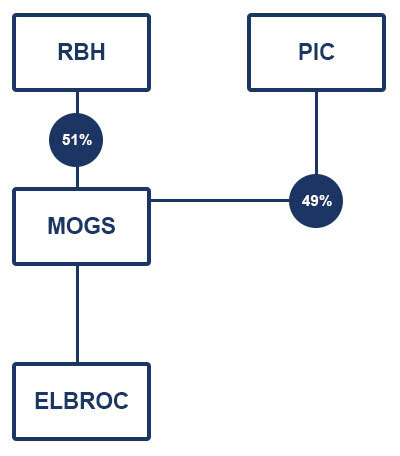 Elbroc’s products have application in all Mines with Gold, Platinum and Coal the primary market. Elbroc’s in-house capability has led to the introduction of the Omni 150 prop (sacrificial and re-usable hydraulic prop). This prop provides up to 190Kn installation load and 400Kn dynamic load at 3m/s. The Omni 150 is used as blast-on support in ultra-deep hard rock mines where stoping applications exceed 1,8 metres and can withstand numerous seismic events. The Omni 150 may also be used in the construction of haulage set structures and has found a niche in coal mines, both locally and internationally, where solutions are provided for pillar rehabilitation, conveyor belt road set construction and on longwall moves. Set installations in excess of 10 meters have been successfully undertaken. All equipment required for underground steel sets are manufactured and supplied by Elbroc. The hydraulically installed XT 150 friction yield prop provides up to 190Kn installation load and 300Kn dynamic load at 3m/s and is used in the same applications as the Omni 150 prop. The mechanically installed T-Prop provides 2 to 3 tons of installation load at the stope face. This temporary support unit can with stand up to 7 tons of load without damage to the unit. The unit is modular which makes it extremely cost effective for any Mine. Elbroc manufacture and supply a remote Drill Rig allowing for 5 meter remote drilling in hard rock Mines. The Omni 89 (sacrificial and re-usable hydraulic prop) provides up to 190Kn installation load and 300Kn dynamic load at 3m/s. The Omni 89 is used as blast-on support in ultra-deep hard rock mines in applications up to 2,0 metres and can withstand numerous seismic events. It is also used as temporary support in applications up to 3,5 meters at lower tonnages using a remote installation arm. The RB 80 Hydraulic Prop is designed to be used as blast-on support in ultra-deep hard rock mines where stoping applications exceed 1,0 metre. Installation load resistance comes in at 170Kn, slow convergence load resistance at 200Kn and dynamic load resistance at 430Kn at 3m/sec. Many products are exported with products like the Omni 150 hydraulic prop having been sold into the USA for over ten years. Elbroc is solutions driven giving rise to products being enhanced, allowing products like the Omni 150 to be offered as a standard in 20 & 40 ton derivatives. Yielding can also be customized within a range from 5 to 40 tons as per customer requirements. Elbroc strive to achieve superior quality and service, and make no compromises in terms of mining safety. Elbroc place an emphasis on clear communication, to ensure that they meet the specific requirements of their customers. This is borne out by the fact that they have an ever increasing customer base locally and in the USA with customers as far afield as Peru, Russia, Great Britain and the United States. Elbroc aims to increase its international exposure by creating partnerships with companies involved in underground support on a distribution or agency basis. The safety of Miners is our business providing the Ultimate Underground Support. Elbroc has an experienced Sales Team which includes an Underground Technical Team to assist with your underground support needs.